Colin Malcolm Donald was born in Colchester in England on 21 March 1910, the son of a retired army Colonel. He had one sister and four brothers of whom two had careers in the army, one was a Professor of Medicine at Edinburgh University and one a forester. He spent his childhood with his parents on a small farming property and received his early education at Dover County School. In 1926, he came to Australia as a boy migrant, under the Wembley Scheme, to Hawkesbury Agricultural College in New South Wales. The scholarship was for one year but he did so well that he continued for a second year and received a Diploma of Agriculture with first class honours in 1928. He won a scholarship to the University of Sydney and in 1932 graduated Bachelor of Agricultural Science, again with first class honours. In 1939, he obtained his Master of Agricultural Science from the University of Adelaide. From 1933-34, he was a Researcher at the Agrostology Branch of the New South Wales Department of Agriculture and in 1934 joined the CSIR Pasture Research Group, then located in the Department of Agronomy at the Waite Agricultural Research Institute. There, he worked initially on strain variation in subterranean clover (Trifolium subterraneum L), prairie grass (Bromus uniloides HB & K) and strawberry clover (Trifolium fragiferum L), and the soil and environmental factors that affected the distribution of different strains. From 1934-39, he also held the position of Mineral Deficiency Investigator at the Waite Agricultural Research Institute in Adelaide. From 1939-41, he was a Pawlett Overseas Scholar studying pasture development in the UK, USA and New Zealand. From 1942-45, he was seconded to the Department of War Organization of Industry, at first with JG (later Sir John) Crawford in Sydney and then as Assistant Director of the Department in charge of the Rural Industries Division in Melbourne. In 1945, he was appointed Assistant Chief of the CSIRO Division of Plant Industry in Canberra, a position he held until resigning from CSIRO in 1954 to take up the position of Professor of Agriculture at the University of Adelaide and Head of the Department of Agronomy at Waite Agricultural Research Institute, a position he held until 1973. On his retirement in 1973 he was appointed Emeritus Professor and Honorary Research Associate at the University of Adelaide. In the late 1930s, Colin Donald was also interested in the mineral nutrition of pastures and worked with Professor HC Trumble (the Waite Professor of Agriculture)on phosphorus and David Riceman (CSIR) on trace elements. With Riceman he made the first discovery in Australia of a trace element deficiency of pastures. This was the copper deficiency that occurred in a region of calcareous soils near Robe in South Australia. The deficiency causes a defect of keratin metabolism resulting in ‘steely wool’ in sheep where the wool loses its crimp and becomes straight and stringy and has reduced strength, elasticity and stainability. Although it was first recognised because of the symptoms in sheep, farmers of the region were unable to grow leguminous pastures or cereal crops and this alerted Donald and Riceman to the fact that the copper deficiency was affecting the growth of many species of plants as well. They found that supplying copper alone did not overcome all the problems and, in collaboration with C Piper, established that there was an associated zinc deficiency. When these two elements were provided, there was a spectacular response in plant growth and the sheep disease was overcome. These discoveries led them to undertake many multi-factorial field experiments with trace elements. During 1939, Colin Donald was awarded a Pawlett travelling scholarship from the University of Sydney to study pastures in Britain, the USA and New Zealand. It was a study tour severely affected by the outbreak of war. However, it did provide him with personal insight into pastures in these countries and he was able to compare them with those he knew so well in Australia. He lectured on the subject on his return and wrote a small book based on his lectures, published in 1941 by Sydney University Press, entitled Pastures and Pasture Research. For many years it was essential reading for anyone wishing to understand and compare the pastures of southern Australia with those of temperate Europe and the USA, where most of the previous work had been done. While in America, Donald met JE Weaver of Nebraska who had studied the habit and size of individual plants growing in communities and therefore in competition with each other for resources. It was a meeting that was greatly to influence Donald’s later interest in plant competition and the growth of plants in communities. This was a subject to which he returned on several occasions in his own research and later with post-graduate students. He drew attention to the effect of this combination on soil fertility, the magnitude of the contribution from the clover’s nitrogen fixation to million of hectares of southern Australia, and the increase in yields of the cereal crops that followed. Donald’s work in this area resulted in papers that have become classics. In the Mediterranean type of environment of southern Australia, seeds germinate in the autumn, plants grow during the winter and set seed before dying in the summer. The repetitive cycle depends on the reproductive capacity of the species involved. He was aware that many annual pasture species, such as annual ryegrass, barley grass, subterranean clover and the annual medics were capable of high seed production in this environment. He was interested in the dynamics of competition that occurred when all the seeds germinated in the autumn and progressively formed a competing sward of plants. The interpretation of this competition that Donald was able to provide with his clear analytical mind was based on careful quantitative analyses. Donald drew attention to the inverse relationship between yield per unit area and yield per plant. He highlighted the fact that to achieve rapid growth of a pasture in the autumn, plants needed to be at a very high density – so high a density, in fact, that each plant suffered intense competition. As a result, individual plants in productive swards were far smaller than a plant growing at a low density in a less productive sward. These papers also illustrated that, later in the year, seed yields rose with density to an optimum, beyond which seed yields would fall with further increases in density. In contrast, biomass rose with increasing density to a point where further increases were slight or the relationship reached a plateau. Donald suggested that light was the principal factor limiting growth when nutrients and water were present in sufficient amounts. This was not the first time he had drawn attention to the importance of competition for light, as he had discussed its significance in his book published in 1941. Then, however, he had referred mainly to interspecific competition, such as occurred between a clover and a grass species in a mixed sward, whereas now he more fully considered intraspecific competition. Donald was aware of the role in Australian pastures of plants of Mediterranean origin, many of which were annuals such as subterranean clover, strawberry clover, annual medics and annual rye-grass. The introduction of these species to Australia until that time had been largely accidental. In 1951, Donald led the first Australian plant-collecting expedition to the Mediterranean countries and with JF Miles collected extensively in North Africa. The expedition was co-sponsored by FAO. It was the forerunner of many other collecting expeditions that have followed. His collection, together with other material collected by C Neal Smith in 1954, was the foundation of several large research programs in CSIRO, the universities and state Departments of Agriculture carried out during the late 1950s and the 1960s. They resulted in many new cultivars. In 1954, in succession to HC Trumble, Colin Donald was appointed the Waite Professor of Agriculture and Head of the Department of Agronomy at the Waite Agricultural Research Institute in the University of Adelaide. It was a position he held until his retirement in 1973, during a period of very rapid expansion of academic staff and post-graduate student numbers. For some time during the 1960s, his department was the largest single-chair department in the University of Adelaide, with seventeen persons with academic status. He rebuilt the plant breeding group and fostered sections concerned with crop nutrition, animal nutrition and pasture utilisation, as well as supporting the strong core theme of agronomy and crop physiology. As a result of his farming background, his tertiary education at Hawkesbury College and the University of Sydney, his research in a state Department of Agriculture, CSIRO and the University and his perceptive intellect, he was able to make significant intellectual contributions to all sections of the Department. Understandably, his personal research and major interactions were with those staff concerned with plant competition and crop nutrition. His research interest at the Waite Institute was on competition among crop plants, notably in wheat or barley crops. His ideas on competition led him to develop, in 1968, the concept of the ideotype. This was a term he coined to be analogous to phenotype and genotype and which described an ‘ideal’ type. The concept was first introduced at the third International Wheat Genetics Symposium held in Canberra in 1968 and was received coolly by cereal breeders at the time. He believed it was possible to define a set of characters – the ideotype – which a crop or pasture plant should have if it were to perform well in the dense communities used by farmers when cultivating crops. In 1991, a special issue of Field Crops Research (26 part 2) was devoted to a review of the ideotype concept and touched on some of the aspects mentioned and evaluated its applicability to a wide range of crop and pasture plants. The term ‘ideotype’ that Colin Donald coined for desirable plant characters has earned him a lasting place in the international literature in crop science. 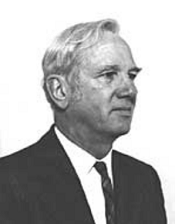 Colin Donald was very much a father figure in the department he led, with nearly all his staff being much younger in age, members of the expansion of the University in the 1950s. He was highly respected for his clear analytical mind, breadth of experience and ready wit. This wit always lay beneath the surface and could emerge even in the most serious moments of a university committee meeting. When an academic argued the value of assaying for weed seeds the filtrate coming from the Murray River’s input to Adelaide’s metropolitan water supply, notorious for its poor potability, Donald remarked that he thought the only objects filtered out by the Engineering and Water Supply Authority were the dead sheep. leadership of a mission to Indonesia in 1963 and a survey of agricultural faculties in Malaysia, Thailand and the Philippines for the Department of External Affairs in 1965. The recommendations of these missions led ultimately to the formation in 1969 of the Australian-Asian Universities Cooperation Scheme (AAUCS) which became the Australian Universities International Development Program (AUIDP) and then the International Development Program (IDP) of Australian Universities and Colleges. On 13 March 1985, at the age of 75, Professor Donald died in Adelaide. He had profoundly influenced pasture development in Australia by understanding the limitations to pasture growth imposed by soils and environment, and had advanced our understanding of competition between plants when grown in communities. Because of his open nature and friendly disposition, he inspired many young researchers in agricultural science. He is the only agronomist yet to have been elected to the Australian Academy of Science. In 1984, the Australian Society of Agronomy, to commemorate him, instituted the CM Donald Medal which is awarded to persons who have made major contributions to agronomic research in Australia. One of the recipients described Colin Donald as the ideotype of an agronomist, a person with the ideal attributes and characters for agronomic investigation. A full account of the life and achievements of Colin Donald can be found by following the links in the Sources below.